When discussing California’s surfing history, which stretches to almost a century (depending upon who you talk to), there seems to be a relatively short list of epic dates when the coast was truly rocked by huge surf big enough to gain the attention of the non-surfing public. These periods of extraordinary size, frequency, and power were probably all a result of the periodic El Niño weather phenomenon that can occur every three to seven years. Mega-disruptions in the ocean atmospheric system are less frequent, seemingly once a decade. The first such surfing year was in 1939 when Rincon, or Three-Mile as it was called back then, was guesstimated at 15-foot by local Mike Sturmer, who was photographed by a guy on the beach with a 16mm camera. This guy called these sparse few locals who paddled out “idiots” for even daring to go out in such dangerous surf. Other mondo swell conditions occurred in 1953 and during 1957-58, 1969-70, 1982-83, and 1997-98. Fortunately for me, I’ve been around long enough to experience three of these whoppers. In December of 1969, Hawaii and then California were pounded by weeks of incredible surf and beautiful high-pressure weather. The surf was huge and it was clean up and down the coast, making for many all-time sessions. Greg Noll paddled into what was considered the biggest wave ever ridden at Makaha during this swell, at well over 30 feet. Waimea Bay was completely closed out, solid white water all the way across, but Honolua Bay on Maui was absolutely all-time. In Santa Barbara, we called it “The Hawaiian Swell” when it arrived, and it was off the charts. 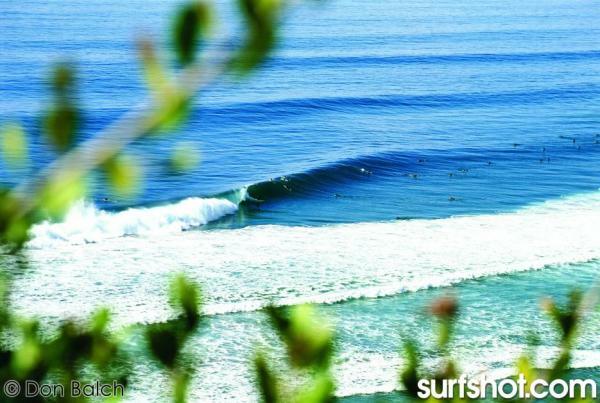 I have super-eight footage of Rincon Cove breaking at a solid 15-foot and catching everyone inside. Nobody had leashes in those days and dozens of boards got obliterated on the highway seawall on one set alone. Mike Hynson, Reno Abellira, and David Nuuhiwa showed up with their down-railed big wave guns and the atmosphere was electric and awe-inspiring. My friends and I rode lesser spots that honestly I have never seen as good. When the only two surf mags at the time came out a few months later, it was amazing to see shots of huge La Jolla Cove, Swamis, and Lunada Bay as well. I wonder now…the Hawaiian swell at Mavericks? Of course, it was unknown in those days, but with that size and those great weather conditions…it was probably a perfect 60 to 80 feet, seriously. Who knows? For me, the next truly memorable swell period was the winter of ’82 -’83. The weather didn’t cooperate as well this time around as there were some wild stormy nights, but there was mind-blowing big surf in between the ferocious weather that blasted the coast. I took photos of homes getting hammered by crushing waves north of Ventura, and I spent a nervous night watching my godparents’ beach house by Miramar Point almost get taken off its foundations by the relentless pounding waves. Santa Barbara County surf spots like Poison Oak Point, El Capitan, Sandspit, and Sharks Cove had insane days of overhead barrels. I recall surfing Campus Point by UCSB on a solid 8-foot session and, unfortunately, while going backside, got blasted from behind at the bottom of one of the bigger sets of the day. My friend, Chris Kunze, saw me take what looked like a direct hit, full force from top-to-bottom by the lip and just get exploded into the air. What actually happened was that the lip hit square on my board’s tail and catapulted me at least 12 feet high. Time seemed to slow down while I was airborne. I thought I was going to be viciously rag-dolled by this crushing wall, but as I fell back down, all of the wave’s power was still exploding upwards and seemed to catch, cushion, and cradle me as if I was in a soft, fluffy cloud of cotton. Incredibly, I felt nothing on what should have been a savage beat down. I popped up in the thick white water and started laughing with glee. My friend stared at me as if I was completely insane. He thought I had gotten totally worked. Funny, the memories you take from certain days. That same winter, Rick Doyle had a SURFER magazine cover shot of monster Blacks with one guy screaming down the face and another poor soul getting annihilated behind him that blew my mind when I saw it. Go-outs during this period at giant La Jolla Cove are still talked about to this day. As a surfer, it was great to have experienced this time. There were a few other years with some occasional big days but the El Niño year of ‘97-98 was another epic standout. I rode some beautiful, emerald walls way out at Little Makaha locally, and captured some memorable photos of triple-overhead La Jolla Cove, macking Blacks, and other spots. As a photographer, I get a rush while just snapping away and preserving these incredible days for posterity. My only question is, when are we gonna have another super-El Niño year? It’s been almost a decade. Time to savor it again like a fine wine. This entry was posted in Feature, Magazine at Blacks. Bookmark the permalink.